Jane Blundell Artist: MAC palette as watercolour palette - all my favourites - can you guess what they all are? 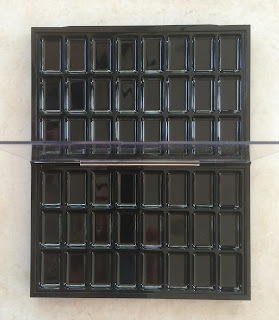 MAC palette as watercolour palette - all my favourites - can you guess what they all are? 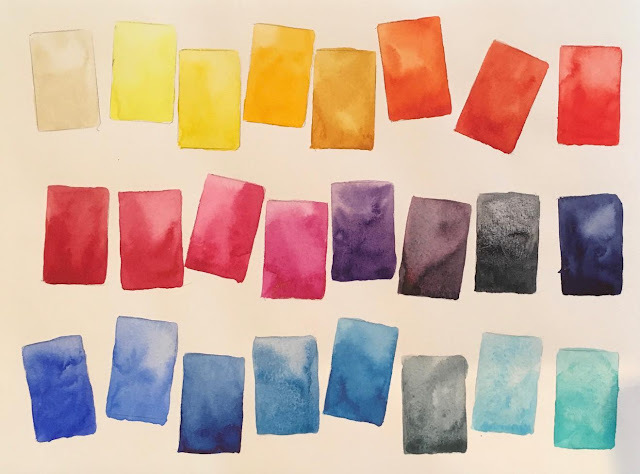 There are many hundreds of different watercolours available, made with hundreds of different pigments and pigment mixtures. Over many years, I've been exploring the various pigments and colours available to find the ones I think are the most interesting and/or generally useful. I have a rather large collection of tubes and many are squeezed into more portable storage palettes, and of course I have my painting palettes. Here I thought I'd go through my favourite watercolours, and explain why I like them. I don't necessarily paint with them all and of course never in one painting! I was looking for a large palette that would hold many different pigments. I didn't need a mixing area in this one, as it was not for painting, but for demonstrating and explaining the differences between various colours and pigments. So I didn't look in traditional watercolour supply stores, but makeup stores. 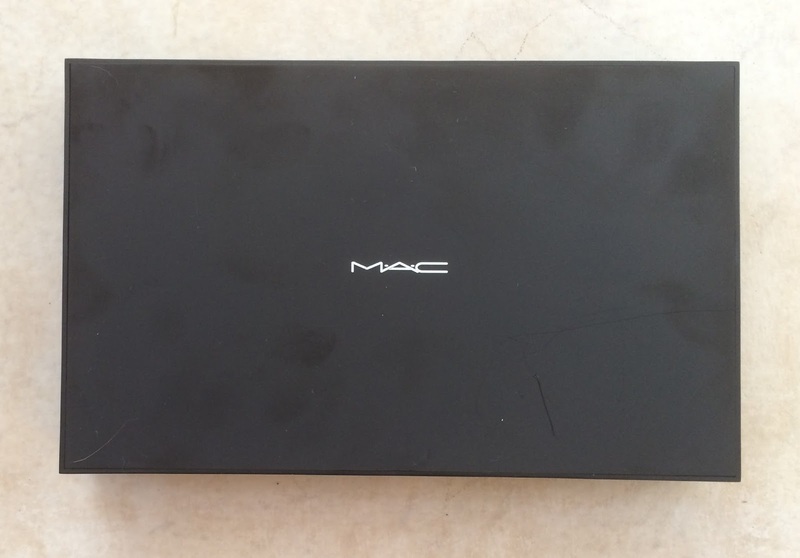 MAC makes empty pro palettes for makeup artists to fill with lipsticks. They are rather flat wells, so don't hold a lot of paint, but they don't need to. They are inexpensive, another bonus. I bought a 24-colour lipstick palette. 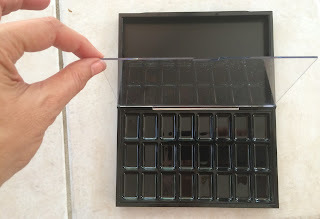 You could, of course, spray the lid section white and use this as a painting palette of 24, but I bought an extra 24-colour insert, creating a 48-colour storage palette. Here it is filled with my favourites. Some of you would be able to make a pretty good guess at what colours are here. Top row: buff titanium, hansa yellow light, hansa yellow medium, new gamboge PY153 (very like hansa yellow deep), quinacridone gold, Da Vinci benzimida orange deep, transparent pyrrol orange, pyrrol scarlet. Middle Row: Pyrrol crimson, carmine, quinacridone rose, Schmincke purple magenta PR122, imperial purple, moonglow, sodalite genuine, indanthrone blue. Top row: cobalt turquoise, viridian, phthalo green BS, jadeite genuine, Jane's black (pyrrol crimson + phthalo green BS), perylene green, undersea green, green apatite genuine. 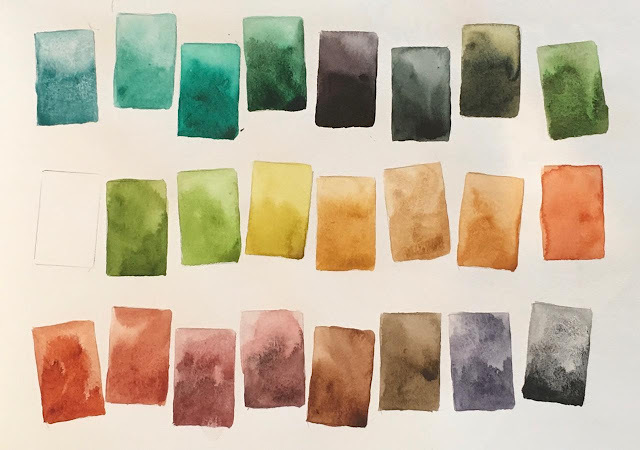 Bottom row: transparent red oxide, burnt sienna, Indian red, piemontite genuine, burnt umber, raw umber, Jane's grey (ultramarine + burnt sienna), lunar black. Of the 47 colours, 42 are Daniel Smith, 2 are my own custom mixes using DS paints and 3 are other brands - a Da Vinci, and Old Holland and a Schmincke. 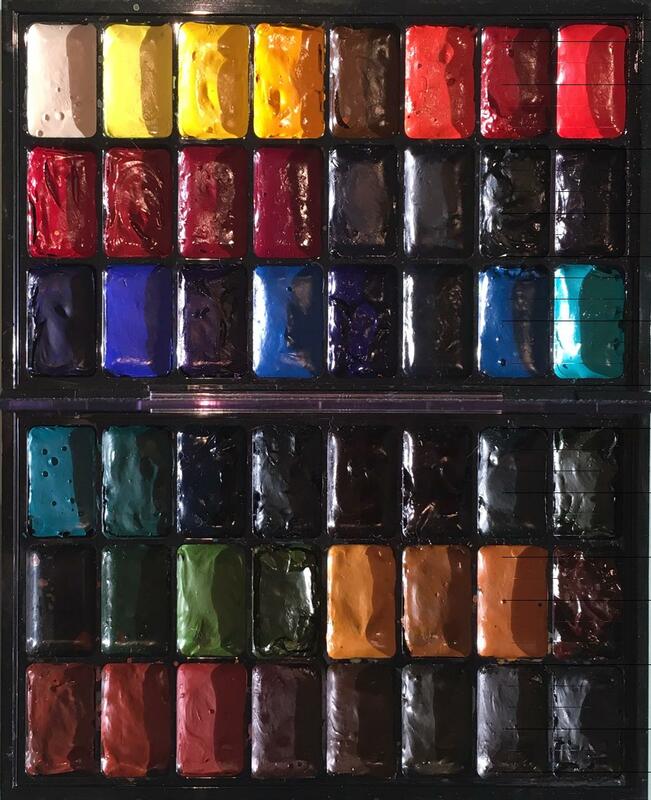 I haven't included any cadmiums, even though they are excellent pigments with specific uses. I have them in my other storage sets! Yes, they are gorgeous :-) I love, love, love your colors ..................and ice cream. Wonderful collection of colors, and I love your ingenious palette! You are right - it's between burnt sienna and Piemontite. I'll add it into the caption. Hi Jane ... When I recently purchased New Gamboge from Daniel Smith, I noticed that it's a two pigment version (PY97, PY110). Is this single pigment version you've often mentioned in your blog from an older stash or is it available from DS? Yes it is now - both good pigments. One of the (few?) advantages of living on the other side of the world is that we sometimes tale a while to get new stock, so if i hear a favourite pigment is being discontinued I generally search a few tubes of the old stock, even if the new formula is perfectly fine. So this is old stock of the PY153. I also have a supply of the two pigment versions of Sap Green, Undersea Green and even the discontinued DS cadmiums. So helpful and once again - inspiring! Thanks for alllll your posts.... Your passion imbues your knowledge and wisdom.